UPDATE - Wednesday 14th May: Patch 1.13 was released this morning to PlayStation 3 and Xbox 360. To download, just make sure your console is connected to the internet and then load up PES 2014. The game will automatically prompt you to update your game. 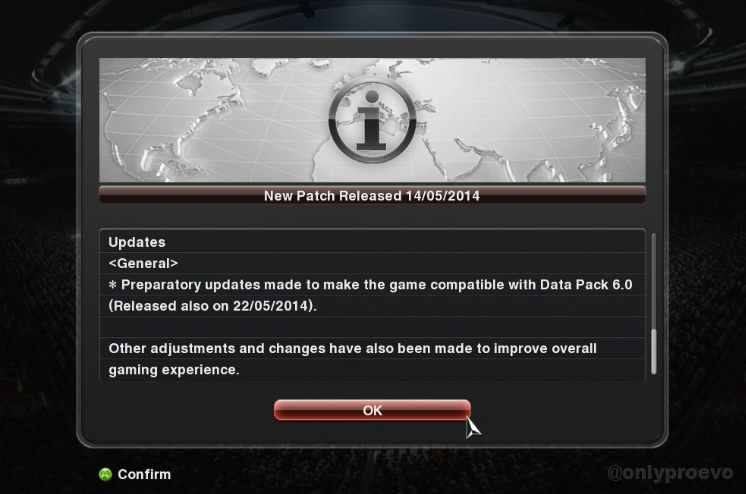 Konami have released the latest patch for the PC version of PES 2014. The new update (Patch 1.13 for DVD version, 1.09 for Download version) improves Data Pack compatibility, and also fixes Online freezing issues which sometimes occurred for users who had installed last month's 1.12 update. Interestingly, the release notes also state that a new DLC release, Data Pack 6, will be available in just under two weeks' time. What DP6 will bring exactly, we're not quite sure yet. However, a safe bet would be to expect updates for all three South American leagues (Argentina, Brazil and Chile), the Copa Libertadores and possibly the AFC Champions League as well. As soon as we get official confirmation, we'll let you know. - Preparatory updates made to make the game compatible with Data Pack 6.0 (Released also on 22/05/2014). - Freezing as experienced by some customers in Online Mode just before a match starts. - Other adjustments and changes have also been made to improve overall gaming experience.